i am a piece of sirloin. USDA grade A 100% all-american. quite some years ago i had a coach who was rather attentive to the body composition of the athletes under his care ("care" is a euphemism, "baleful glare" would be more apt, "obsessive preoccupation" would be the most clinically accurate). he would have us log a weekly chart of our body fat percentage to help us (and perhaps more importantly, him) track our progression (or more preferably, degression) of personal lipids. lest we be tempted to record optimistically false numbers, he magnanimously--and gently--offered us the advantage of his access to university resources, including a physical therapy staff equipped with any number of bodyfat-measuring devices. for him, fat was a scourge. adipose, cellulite, blubber, flab, jiggles, thunder-bumpers, call it what you will, he considered it the bane of athletic endeavor. it was the useless deadweight that served no purpose, except to impede physical performance. and by doing this, it served to impede the qualities which came from the pursuit of physical performance: discipline, diligence, commitment, courage, aspiration, achievement. which meant that fat was more than just a threat to the human body; it was a threat to humanity itself. it was, in all truth, tantamount to being the greatest evil our species has likely ever encountered. which was probably why he held to a logic that your body was a reflection of your spirit and mind: where a lazy body means a lazy spirit and a lazy mind, a strong body means a strong spirit and a strong mind, because to have one requires that you have the others. which probably also explains why he insisted on us doing everything we could to reduce our body fat levels. which, unfortunately, for the young man i was, didn't really mean much, content as i was to test the limits of my mortality with a steady diet of gustatory delicacies that would have shocked and horrified him: hamburgers, cheeseburgers, chili, chili burgers, chili cheese burgers, chili cheese dogs, chili cheese fries, chili fries, fries, curly fries, steak fries, whole fries, followed up with ice cream, pies, cakes, cookies, muffins, scones, donuts, milkshakes, floats, and malts, all the time any time every time for post-workout meals, mid-afternoon snacks, midnight munchies, and 3 am all-nighter breaks. every day every week every month every year. based on my coach's reactions to my body fat numbers, i'm guessing it must have showed. "you see this? you see this?" (he loved to repeat himself for emphasis) "you see this?" (he was holding up the round steak) "what do you see?" i nodded and said, yes, it had very nice marbling. the veins in his neck visibly bulging, he pushed it closer to my face. "fat!" he spat out "fat! faaaaaaaaaaaaaaaaat!" (see what i mean by repeating himself? with the additional mangling of pronounciation?) "disgusting! diiiiiiiisssssssss-guuuuuuuuusssssssssssss-tiiiiiinnnnnngggggggg!!!" he then waved the sirloin, and asked "you see this? what do you see?" i said, no, no fat. he sighed, nodded, looked deep into my eyes, the veins in his neck so thick they pushed his jaw forward into my nose. "that's right! no fat! noooooooooooooooooo faaaaaaaaaaattttt! lean! leeeeeeeeeaaaaannnnnnn!!!" he then set the meat down, looked at me, and then at everyone else, and said abruptly: "and THAT's what i want you to be! sirloin steak! not the the fat round steak with the nice marbling, but the fat-free, lean sirloin!" i've thought about this quite a bit over the years. 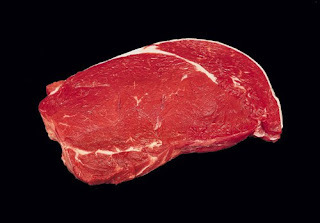 not so much about the idea of being compared to meat--because i've had all number of coaches compare me to a piece of meat, so i've become rather used to it...it's quite comforting, really (but that's a story for another post)--but more about the idea that i was a specific kind of meat. you know: not just any meat, but a special kind of meat. the kind that only develops through use. real use. the kind not possible for a recreational armchair weekend warrior. the sort you can't fake or hype or exaggerate. to a degree that it burns out the blubber, eliminating the deadweight and only leaving only the tissue that is functionally productive. the kind that shows there is no laziness, but only something strong. the kind that shows what i've become. because you see, i think my old coach would be shocked but no longer horrified--in fact, he might be shocked but incredibly pleased--to know that in the years since he knew me i have undertaken all manner of training, dieting, working, and thinking to change my capacity for physical performance, and in so doing had to exercise all manner of discipline, diligence, commitment, courage, aspiration, and yes, achievement, to change myself. and i found that changes in the body required changes in the spirit and mind...changes greater than anything i ever imagined, on orders of magnitude that i will never be able to measure. except perhaps this: the changes were enough to get my body fat content to 6%. and in season even lower (around 4%). you see, i was in the grocery store the other day, and i actually checked the sirloin steaks to check for their fat content. they've started putting nutrition labels on the meat, and i figured it was time to see just how bad the damage was from the food that i'm ingesting. and on the label for the sirloin, in very clear numbering, it read: "fat: 6%." it was funny. i didn't think about my coach. well, okay, i did, but only for a little. what i really thought about was what that number means...about how far i've come. yeah, i am a piece of meat. but just not any piece of meat. yes. yes, indeed. i am.